After Damascus, Amman looks disappointingly American, but I'm hoping there's more to discover under the surface. Well, I'm here. The big Mercedes taxi got me to Amman and I've found my way to the Rama Hotel near Amman's 7th Circle to meet up with my group of 27 fellow American college students, with whom I'll be spending the next four months or so studying Arabic and more here. No problems so far, other than the wonderful stomach/digestive tract issues that have been dogging me for the past week. Nothing I can't handle though, and if that's all I have to deal with I figure I'm doing ok.
way; that process was much more interesting, and I prefer it to having a whole set of preconceptions about the structure of Jordanian society programmed into my head from the start, which seems to be the goal this week. 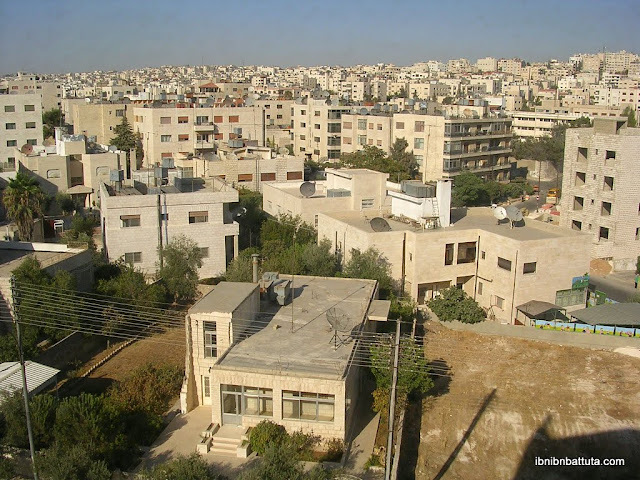 Amman definitely doesn't resemble anywhere back in Syria. It is huge, unlike tiny but bustling little Damascus, and looks much more Westernized. Burger King, McDonald's, KFC, and Popeye's are all around; there's apparently even a Taco Bell and Starbucks. I move into my homestay (yay!) on Thursday. My program's organizers tell me that a few members of my new family speak English, but inshallah I can make it clear from the start that I'm here to continue learning Arabic!